Checking in with Amplitude's 4X sequel, eight months later. Last summer, Endless Space 2 launched from its early access pod into the cold, harsh cosmos of full release. In the trademark style of Amplitude Studios, the space opera eschewed the grandness of many of its 4X peers in favour of a tighter, more story-led approach based around well-written questlines and a relatively small number of playable factions, each with distinct personalities and asymmetrical play styles. But as with all things 4X, the launch was only the beginning of its journey. In Chris's review, he pointed out that, "Endless Space 2 is a good game, but there's no getting around the fact that it'll be a better game in six months". So eight months on, with a couple of major updates under its belt and the release of its first paid DLC, The Vaulters. last week, I’ve checked out how it's coming along. Let’s start with the DLC. The Vaulters sees the faction of human underground dwellers from Endless Legend go spacebound, after successfully fleeing the planet of Auriga before it got snowed under by the Endless Winter. That’s a lot of proper nouns to take in, but it feels apt for a DLC that’s tailored more for the existing Endless fanbase rather than prospective newcomers. The Vaulters faction is good fun (even if Endless veterans may notice that their main trait is copy-pasted from Endless Space 1). They’re a buccaneering bunch, with the ability to swiftly zip around space using portals that they build within their own star systems. It’s quite possibly the most powerful faction trait in the early-mid game, offset only much later upon the discovery of wormholes and improved movement speeds. For starters, it cuts down on the number of fleets you need guarding your empire, because with well-placed portals you can be almost anywhere at once. You can also use it to attack enemies using a steady stream of ships produced all over your empire, then funnelled through one portal, making it difficult for your enemy to see exactly what they’re up against. The vaulters’ other ability disguises their fleets as privateers, which is a nice way to cause mischief on the sly. Sure, you can be best buds with the faction you (begrudgingly) share a constellation with, but if no one’s going to tell you off for plundering their supply ships or Pearl-Harbouring their fleets as they sit in their systems, why wouldn’t you? The DLC also packs in some new heroes, quests and other bits, but don’t expect any big mechanical changes similar to those in Endless Legend’s similarly priced content. The only notable evolution on this front is Pirate Diplomacy—the latest stage in Amplitude’s reworking of the pirate system. But first, some context. When Endless Space 2 launched, pirates were roaming fleets with a random minor faction name slapped onto them. Given how much effort had gone into giving each minor faction their own history, quests and ideological traits, it felt a little perfunctory to have them randomly assigned as pirates. This changed with the free Galactic Statecraft update last November. Pirates became their own entity, residing on star systems reappropriated as pirate lairs, where their fleets and power steadily grow if left unchecked. Pirate Diplomacy, introduced in The Vaulters, builds on this, letting you interact with the stumpy, Watto-like leader of these pirate lairs. You can sabotage their lair to stunt their levelling, or offer them ‘Support’, which will make them stronger but also more loyal to you, and more effective should you hire them to launch attacks on an enemy’s system. It’s a neat addition, but still in need of tweaking, as currently the inflated costs of liaising with pirates outweigh the benefits by mid-game. Looked at in isolation, the Vaulters DLC doesn’t amount to that much if its faction means nothing to you, but in the context of how much work Amplitude have put into the game since release, a little cash injection feels well deserved (especially when you look at the proliferation of content in its cosmic rival Stellaris, where Paradox has, true to form, left the DLC tap dripping). Along with the pirate revamp, the most notable improvement Amplitude has made over these past eight months is diplomacy. At launch, one of my biggest problems was that for a game priding itself on unique factions, their personalities never shone through on the diplomacy screen. You could go half a game without the AI approaching you, and there were not enough options to evoke the feeling that you’re constantly spinning the plates of interstellar relations. Since the Galactic Statecraft update, factions can exert pressure on each other via bureaucratic imbroglios and diplomatic requests, such as asking you to get your ships off their territory, or to stop attacking their fleets. How these situations are resolved then has short-term knock-on effects for your empires; do you denounce a trespasser who refuses to leave, or create a cover-up so no one finds out that you’re a galactic doormat? Either way, there will be statistical consequences. Alliances, meanwhile, are no longer a case of just announcing to the galaxy that you’re BFFs, signing the odd trade agreement and embarking on the odd intergalactic war. They’re now more complex affairs that embrace this more confrontational approach to diplomacy. You and your allies can set co-ordination points for each other if you need help in battle (expect them to throw a huff if you don’t heed the call), and if one alliance member enters a war that another deems unjust, you can renounce the alliance on the spot. It’s become a fine repertoire of options. Crucially, the AI actually utilises them, making each game feel much more rowdy than before. The silence of space is now filled with the din of different peoples pleading and bitching and threatening each other; it really feels like a gloriously concentrated space soap opera. Comparisons between Endless Space 2 and Stellaris are inevitable, given how more time-constrained players might only be able to pick one game in the ‘Space-based Strategy Timesink’ genre (that I may I have just made up). But their co-existence also highlights their distinct qualities. Stellaris is outward-looking, like an astronomical telescope, embracing the daunting vastness of space with its randomised races and systemic oddities. To that end, it has been expanding apace, adding layers upon layers of systems to capture some of that infinite complexity. Endless Space 2 is doing the opposite, quietly tightening up the web of galactic relations binding its motley factions together. It’s not expanding as such, but rather deepening the intrigue and interactions in its corner of the universe. The game’s progress and DLC may not be as eye-catching as, say, an expansion pack about blowing up planets, but there’s a refreshing humility about Amplitude’s work, with much of it being based on a close relationship with its community. 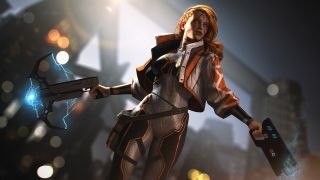 A more comprehensive expansion that shakes up the mechanics is surely forthcoming, but Amplitude isn’t in a rush, focusing on content that puts its existing player base first.